Are BHP Billiton and Rio Tinto Destroying Their Own Industry? The accusations are flying and no one seems to willing to accept the blame. Is this just business as usual or a troubling sign for investors? Earlier this year Rio Tinto plc (ADR) (NYSE:RIO) and BHP Billiton Limited (ADR) (NYSE:BHP) were accused of destroying industry pricing in the iron ore industry. And the fight isn't exactly between tiny, no-name Davids and industry Goliaths; the fourth largest global producer of iron ore, Fortescue Metals, and diversified mining giant Glencore were doing the accusing. Is there any merit to the name calling or is it just tough competitors battling it out for market share in a difficult market? Iron ore has been a volatile industry of late, but most of the volatility has been to the downside. That, however, is after a massive price increase leading into the recent peak in 2011. Since that top, supply and demand have been out of balance, leading to lower prices. That's hurt the entire industry, and now some in the industry are pointing fingers and laying blame. But how realistic is this? 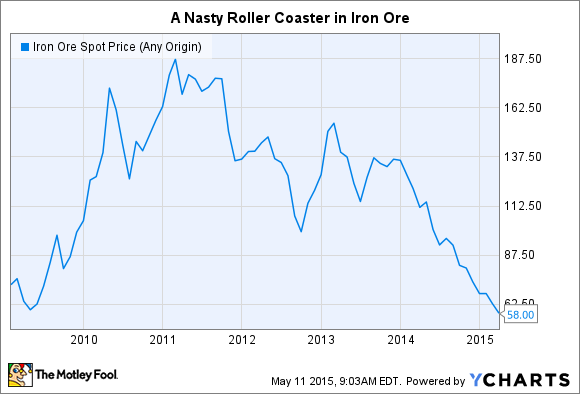 Can just a few companies really be blamed for the entire iron ore industry's malaise? Rio, one of the two accused "culprits," increased its iron ore production from 244.6 million tonnes in 2011 to 295.4 million tonnes last year. In 2014 alone, production increased 11%. Meanwhile, revenues in the company's iron ore unit were roughly $29.5 billion in 2011 and just $23.3 billion in 2014. Net earnings from the group, meanwhile, were $13.2 billion in 2011 and $8.1 billion last year. Low prices are taking a big toll. BHP, meanwhile, produced 134.4 million tonnes of iron ore in its fiscal year ended June 2011. In the fiscal year ended June 2014 production stood at 203.6 million tonnes. Revenues, meanwhile, were down just like at Rio. Looking at these numbers, you can't help but ask: Why would these two industry giants keep producing more and more iron ore while prices are tumbling? But the accusations haven't gone without challenge. At a recent conference, Andrew Harding, the CEO of Rio Tinto's iron ore business, said, "Rio Tinto, of the top three suppliers out of Western Australia, is the third-largest increaser of supply in the market and FMG [is] actually the largest." That was backed up by a BHP representative who explained, "FMG is the most prolific grower." For reference, FMG is none other than Fortescue Metals, the very same company accusing Rio and BHP of oversupplying the market. And the numbers are shocking. According to BHP, between 2008 and 2014 the compound annual growth rate of iron ore exports attributable to Rio was around 8%, BHP about 11%, and Fortescue 46%. Who's oversupplying the market? In fact, BHP goes on to explain that it hasn't approved a major iron ore project since 2011, focusing instead on productivity gains. And there are two important things here. First, mines take years to build. So leading up to the iron ore price peak, companies were in the process of building mines only to have them come on line when prices started to flounder. That's unfortunate, but not necessarily surprising. Years of excess investment often lead to retrenching. It's just part of the industry cycle. Second, a company risks losing market share if it halts production growth while competitors are pulling more iron ore out of the ground. Indeed, iron ore demand hasn't stopped, it just isn't keeping up with supply. If BHP or Rio just held their production constant when customers were looking for more supply, they would force their customers to go somewhere else. In fact, defending market share is exactly what Rio Tinto's Harding ticked off as a key priority. This type of blame game is actually nice to see, even though it looks kind of ugly. The reason is that it suggests companies are getting desperate, which can signal the beginning of the end of the bad times. Are BHP and Rio doing anything nefarious? What about Fortescue? At the end of the day, it looks far more like they are all just operating as best they can in a tough market. When demand and supply are better aligned, and prices start to strengthen again, Rio and BHP will be well prepared to benefit because of their production increases. When will that industry upturn happen? It's starting to look like sooner rather than later.